Everyone knows there's nothing like waking up and mowing down on a big breakfast: eggs, bacon, sausage, toast, and the like. Usually these breakfasts are for "special occasions only" and we eat tasteless, shapeless slop on the other 362 (or so) days of the year. 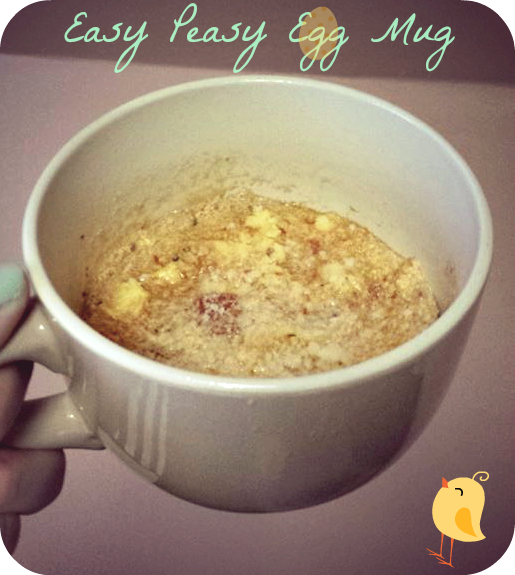 Well, I'm here to challenge the boring and add spice to your breakfast once again with the Easy Peasy Egg Mug! Just so you know, there are a million trillion ways that an egg mug can be made, using a zillion different ingredients, so please add what will please you the most! Examples of ingredients include: tomatoes, cheese, pepperoni, sausage, beef crumbles, etc.! Today, I'm going to give you the ingredients to make the pepperoni pizza egg mug pictured above in my half bowl, half mug. Spray your mug with non-stick spray. Pour egg substitute inside. Break up cheese wedge and place in the mug with the egg. Microwave for 1 minute. Gently stir and microwave for another minute. Tear up the pepperoni slices and add them and the tomatoes to the mix. Fluff mixture with a fork. Microwave for 15 more seconds, or until hot, then enjoy! Just so you know, one mug of this delicious concoction is only 187 calories, so eat up, my friend! I swear on everything I know and love that this recipe is eggs-ellent!